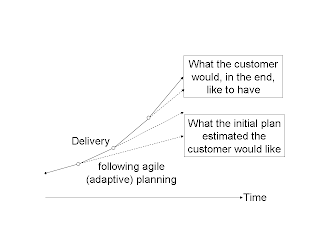 In a world with enormous uncertainty, what is the best planning methodology? 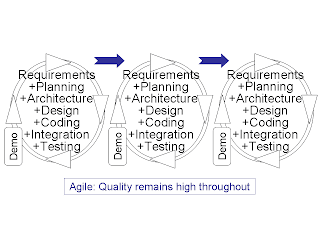 I’ve long been sceptical about elaborate planning – hence my enthusiasm for what’s often called ‘agile‘ and ‘lean‘ development processes. 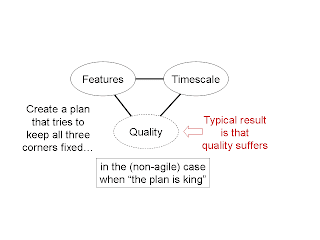 Indeed, I devoted a significant chunk of my book “Symbian for software leaders – principles of successful smartphone development projects” to comparing and contrasting the “plan is king” approach to an agile approach. In the early 1990s, while I was a software engineering manager at Psion, my boss at the time recommended I read Reinertsen’s “Developing Products in Half the Time“. It was great advice! In the early 200xs, while I was EVP at Symbian, I remember enjoying insights from Reinsertsen’s “Managing the Design Factory“. I was recently pleased to discover Reinertsen has put pen to paper again. 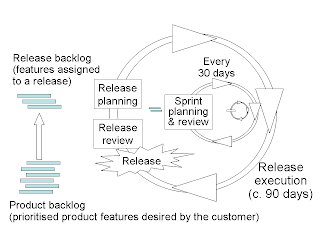 The result is “The Principles of Product Development Flow: Second Generation Lean Product Development“. 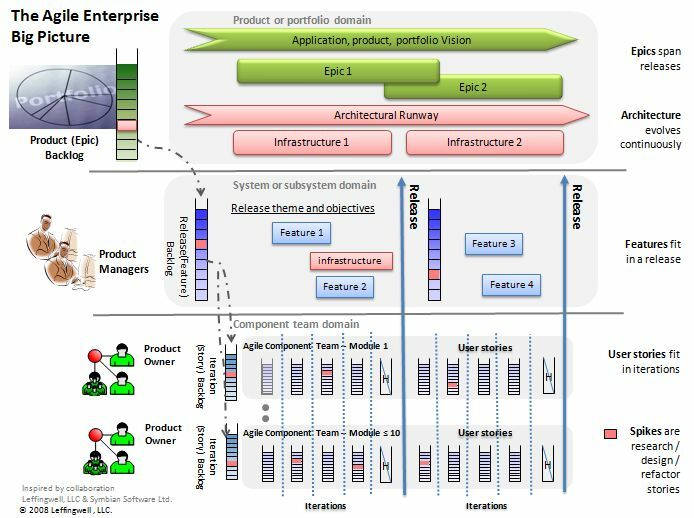 This new standard on lean product and software development challenges orthodox thinking on every side and is required reading. It’s fairly technical and not an easy read but well worth the effort. Even in the first few pages, I’ve found some cracking good quotes. Our central premise is that we do product development to make money. This economic goal permits us to use economic thinking and allows us to see many issues with a fresh point of view. It illuminates the grave problems with the current orthodoxy. The current orthodoxy does not focus on understanding deeper economic relationships. Instead, it is, at best, based on observing correlations between pairs of proxy variables. For example, it observes that late design changes have higher costs than early design changes, and prescribes front-loading problem solving. This ignores the fact that late changes can also create enormous economic value. The economic effect of a late change can only be evaluated by considering its complete economic impact. In addition to deeply misunderstanding variability, today’s product developers have deep-rooted misconceptions on how to react to this variability. They believe that they should always strive to make actual performance conform to the original plan. They assume that the benefit of correcting a deviation from the plan will always exceed the cost of doing so. This places completely unwarranted trust in the original plan, and it blocks companies from exploiting emergent opportunities. Such behaviour makes no economic sense. We live in an uncertain world. We must recognise that our original plan was based on noisy data, viewed from a long time-horizon… Emergent information completely changes the economics of our original choice. In such cases, blindly insisting on conformance to the original plan destroys economic value. To manage product development effectively, we must recognise that valuable new information is constantly arriving throughout the development cycle. Rather than remaining frozen in time, locked to the original plan, we must learn to make good economic choices using this emerging information. We are interested in finding economically optimum sequences for tasks. Current practices use fairly crude approaches to sequencing. For example, it suggests that if subsystem B depends on subsystem A, it would be better to sequence the design of A first. This logic optimises efficiency as a proxy variable. 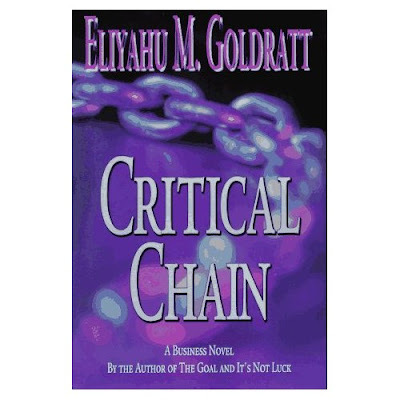 When we consider overall economics, as we do in this book, we often reach different conclusions. 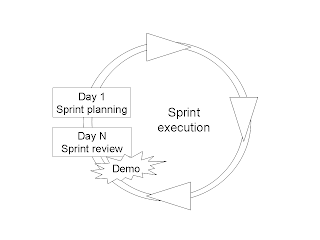 For example, it may be better to develop both A and B simultaneously, despite the risk of inefficient rework, because parallel development can save cycle time. In this book, our model for flow control will not be manufacturing systems, since these systems primarily deal with predictable and homogeneous flows. Instead, we will look at lessons that can be learned from telecommunications networks and computer operating systems. Both of these domains have decades of experience dealing with non-homogeneous and highly variable flows. Developers rely on feedback to influence subsequent choices. Or, at least, they should. Unfortunately, our current orthodoxy views feedback as an element of an undesirable rework loop. It asserts that we should prevent the need for rework by having engineers design things right the first time. We will present a radically different view, suggesting that feedback is what permits us to operate our product development process effectively in a very noisy environment. Feedback allows us to efficiently adapt to unpredictability. We will discuss two common methods of constraining WIP: the kanban system and Goldratt’s Theory of Constraints. These methods are relatively static. We will also examine how telecommunications networks use WIP constraints in a much more dynamic way. Once again, telecommunications networks are interesting to us as product developers, because they deal successfully with inherently high variability. Hopefully that’s a good set of tasters for what will follow! What are the platform choices? What are the app store choices? The event was sold out, and the room was packed. I didn’t hear anyone question the need for companies to have a mobile strategy. Nowadays, that seems to be taken for granted. The hard bit is to work out what the strategy should be. Examples of relatively new mobile platforms include Samsung’s bada and Nokia’s Maemo. Want to include richer functionality in their app than can be delivered via standard mobile browsers. The mobile industry is aware of these problems, and is pursing solutions on multiple fronts – including improved developer tools, improved intermediate platforms, and improved management of compatibility. For example, there is considerable hope that HTML 5.0 will be widely adopted as a standard. However, at the same time as solutions are found, new incompatibilities arise too – typically for new areas of mobile functionality. The suggestion I raised from the floor during the meeting is that companies ought in general to avoid squaring up to this fragmentation. Instead, they should engage partners who specialise in handling this fragmentation on behalf of clients. Fragmentation is a hard problem, which won’t disappear any time soon. Worse, as I said, the nature of the fragmentation changes fairly rapidly. So let this problem be handled by expert mobile professional services companies. This can be viewed as a kind of “mobile apps as a service”. These professional services companies could provide, not only the technical solutions for a number of platforms, but also up-to-date impartial advice on which platforms ought to be prioritised. Happily, the number of these mobile-savvy professional services companies (both large and small) is continuing to grow. The specification will therefore improve as the project unfolds. This strongly argues against any hands-off outsourcing of mobile app development to the professional services company. Instead, the professional services company should operate in close conjunction with the domain experts in the original company. That’s a mobile application strategy that makes good sense. Entries for Symbian’s 2008 Student Essay Contest have just closed. The deadline for submission of entries was midnight (GMT) on 30 September 2008. I’ll give the answer at the end of this article. It surprised me – though I ought to have anticipated the outcome. After all, for many years I’ve been telling people about “The Student Syndrome”. Like all Goldratt’s novels, Critical Chain mixes human interest with some intriguing ways of analysing business-critical topics. The ideas in these books had a big influence on the evolution of my own views about how to incorporate responsiveness and agility into large software projects where customers are heavily reliant on the software being delivered at pre-agreed dates. A smartphone project plan is made up from a large number of estimates for how long it will take to complete individual tasks. If the task involves novel work, or novel circumstances, or a novel integration environment, you can have a wide range of estimates for the length of time required. It’s similar to estimating how long you will take to complete an unfamiliar journey in a busy city with potentially unreliable transport infrastructure. Let’s say that, if you are lucky, you might complete the journey in just 20 minutes. Perhaps 30 minutes is the most likely time duration. But in view of potential traffic hold-ups or train delays, you could take as long as one hour, or (in case of underground train derailments) even two hours or longer. 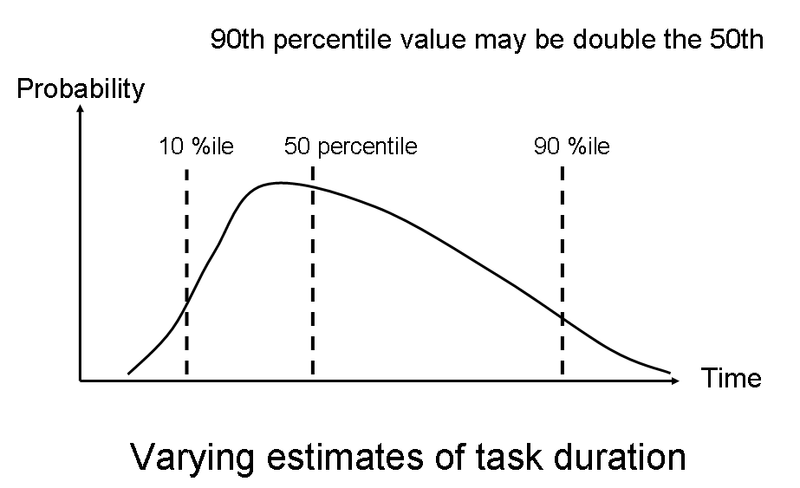 So there’s a range of estimates, with the distribution curve having a long tail on the right hand side: there’s a non-negligible probability that the task will take at least twice as long as the individual most likely outcome. It’s often the same with estimating the length of time for a task within a project plan. Any estimate the developers provide may get squashed down by aggressive senior managers (so they’d better pad their estimate in advance, making it even longer). 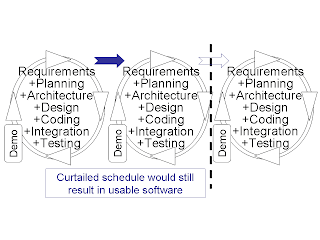 Critically, even when a task is ready to finish earlier than expected, the project plan can rarely take advantage of this fact. The people who were scheduled for the next task probably aren’t ready to start it earlier than anticipated. So an early finish by one task rarely translates into an early start by the next task. On the other hand, a late finish by one task inevitably means a late start for the next start. 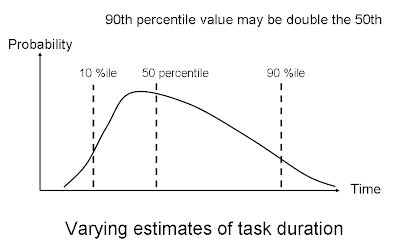 This task asymmetry drives the whole schedule later. This line of analysis is one I’ve run through scores of times, in discussions with people, in the last four or five years. 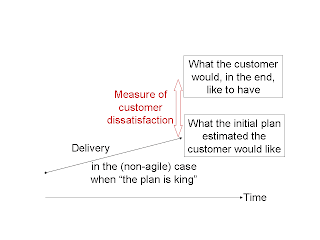 It feeds into the argument that the best way to ensure customer satisfaction and predictable delivery, is, counter-intuitively, to focus more on software quality, interim customer feedback, agile project management, self-motivated teams, and general principles of excellence in software development, than on schedule management itself. Symbian’s experience over many years bears out the same conclusion. 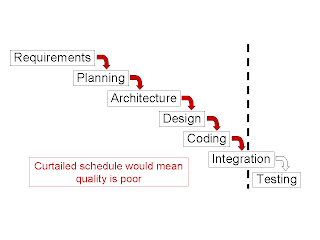 The more we’ve focused on achieving high quality, the better we’ve become with both schedule management and internal developer productivity. Indeed, 16% of the essays submitted were received in the final 60 minutes. Agile software methodologies (associated with names like “Scrum” and “eXtreme Programming”) have historically been primarily adopted within small-team projects. They’ve tended to fare less well on larger projects. 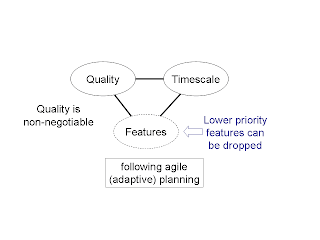 Dean Leffingwell’s book “Scaling Software Agility: Best practices for large enterprises” is the most useful one that I’ve found, on the important topic of how best to apply the deep insights of Agile methodologies in the context of larger development projects. I like the book because it’s clear (easy to read) as well as being profound (well worth reading). I liked the book so much that I invited Dean to come to speak at various training seminars inside Symbian. We’ve learned a great deal from what he’s had to say. Dean says he’s working on an article that pulls all these ideas together. I’m looking forward to it!